For sixteen years the animated television show South Park has been cruising the airwaves, generating a lot of controversy and laughs along the way. The show is based on a group of four school children named Stan, Kyle, Cartman, and Kenny who all live in South Park, Colorado and documents their exploits, which are often times tied to real world events. The series has been very popular since it launched, generating a large merchandise empire, a blockbuster film, and several video games that put players smack in the middle of the absurdity. 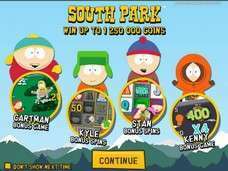 Recently, Swedish Internet betting software developer Net Entertainment released the first official South Park slot games for online casinos. The game was made instantly available to players on Android devices, and carries all of the hallmarks of the PC version, including the bonus features and sharp wit of the foul-mouthed fourth graders. If you are accessing this page from your mobile phone, please note this free game is only available for desktop users as it is not compatible with Android, Apple or Windows Phone devices. If you click the external links on this page you can access a mobile compatible version of the game. Because we work to cover as many Android casinos as possible, we see many Android slots that are basic and contain blasé graphics and animations. South Park breaks this mold and offers a fully animated and beautiful slot experience to punters. 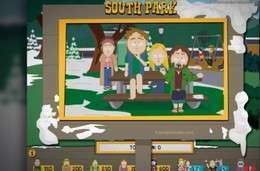 The game contains graphics that are identical to the construction paper-esque style used in the production of South Park, and wins are fully animated. When character wins are won, the symbols chirp in with a quick quote as well as a brief animation to fully bring home the experience. The slot looks fantastic on my HTC Butterfly’s five inch screen, and is equally as gorgeous on my Galaxy Tab’s 10 inch screen. When it comes to actually playing South Park, the experience is very smooth on a touch screen Android device. Having larger fingers, I often times am frustrated as to just how difficult hitting the right buttons can be. South Park gave me no issues whatsoever though, and the game was very responsive to my touch. South Park’s Android slot game is a 25 payline, 5 reel/3 row style video slot that plays very fast, which is great considering all of the extras thrown within. I never had an issue with getting bored while playing South Park on my Android, as there is enough extra stuff going on that you can never really take your eyes off of the reels. A prime example of this is when you are spinning the reels, waiting for things to drop. All of a sudden, Canada’s most famous performers Terrance and Phillip leap onto the screen, farting random Wilds all over the reels. The scene is hilarious, and opens the possibility of scoring a massive win. Other random events that I encountered while playing the South Park slot on my Android device include: Cartman coming out and putting a massive Beefcake wild symbol which takes up three of the reels, and Mr. Hankey the Christmas Poo coming out and leaving his “mark” all over the reels, also turning them Wild. These random events are among the most entertaining I have ever seen on a mobile slot, and definitely kept me spinning the reels longer than I can ever recall. 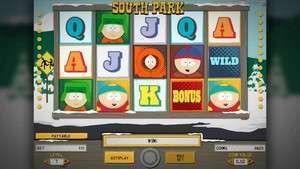 South Park also includes many traditional slot extras to enhance your chances of winning, including: Free Spins, Wild Substitutions, Sticky Wilds, and the three aforementioned mini-features. These extras are all done in a very creative method, and will make you laugh out loud (which can generate some weird stares when you are out in public). The brightest spot of this Android slot is the bonus features, which work to feature all of the main characters of South Park in humorous ways while earning you some big prizes. Cartman- As Eric Cartman, you are tasked with hunting down hippies in the park using your fire extinguisher. You will need to click on various bushes to spray the hippies, and collect cash prizes, win multipliers, and the chance to play multiple times. The feature is ended when you spray Officer Barbrady. Stan- As Stan Marsh, you are nervous around your girlfriend Wendy, puking on her and getting free spins and sticky wilds in the process. Kenny- As Kenny, you are trying to move down the road and cheat Death. Every selection you make will either award you a large win, or kill you. The choices are hard, fun, and hilarious! Kyle- As Kyle Broflovski, you will get the opportunity to kick your adopted Canadian brother Ike when his Wild Symbol pops up during the free spins bonus feature. Kicking the baby will allow you to win additional cash prizes, win multipliers, or extra spins (during which time you can kick Ike some more). Overall, I have to say that the South Park Android compatible slot is probably my favorite mobile game of all time. I spent well over an hour playing this title on my Android, and actually had to connect my phone to a charger in order to keep playing! The bonus features are fantastic, the graphics are beautiful, and I have never played a mobile slot that has the kind of humor that South Park does. If you live in an area that allows you to play this game for real money, do so. It is simply the best out there.